Poor service delivery in the government administered National Rural Employment Guarantee Scheme (NREGS) have led a local CSO, SAMBANDH, to increase citizen awareness and participation in the Odisha District of Orissa, India. 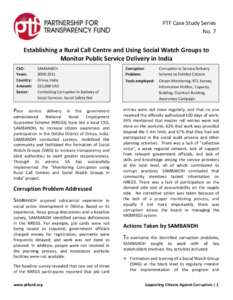 SAMBANDH conducted surveys, mobilized the community and facilitated the formation of Social Watch Groups (SWG) to increase transparency and elicit authorities to exert greater responsiveness. Through its actions, SA has successfully implemented the “Monitoring Corruption using Rural Call Centres and Social Watch Groups in India” project.